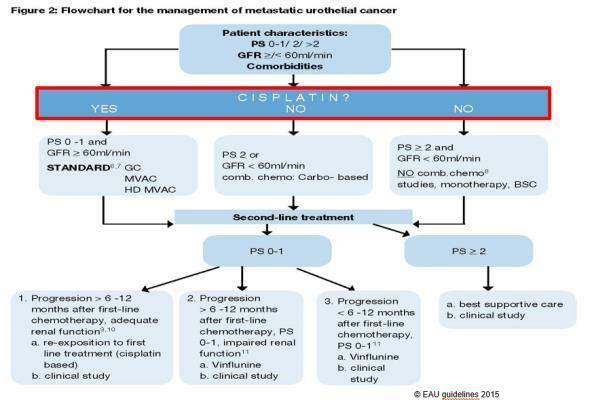 The management of metastatic urothelial cancer patients with regards to chemotherapy administration is well-defined and currently included in EAU guidelines. 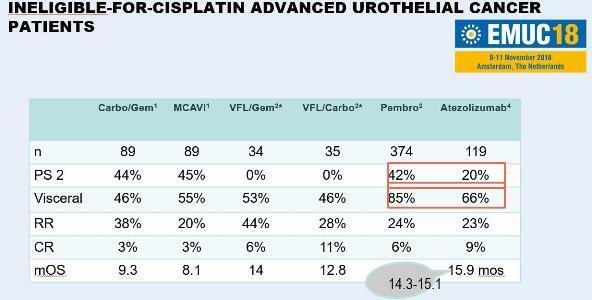 However, in daily practice, approximately 50% of our patients are not eligible to cisplatin. The survival expectations for these patients are lower than 1 year. Immunotherapy can change this scenario. Considering the first line metastatic disease, currently only Phase II trials are available. Pembrolizumab and Atezolizumab showed promising results in this setting. 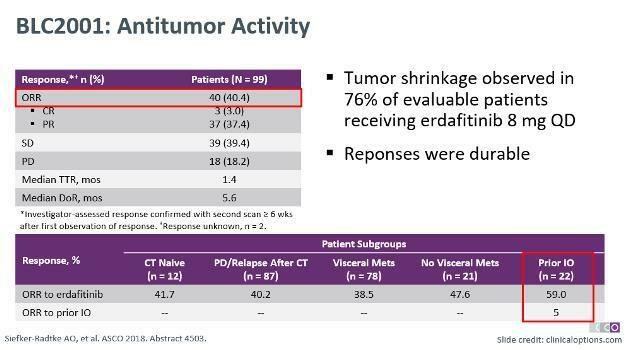 Specifically, considering that in these trials patients treated with pembrolizumab or atezolizumab had the worse characteristics, with higher rate of PS2 and presence of visceral metastases. As a consequence of these results, both drugs have been approved as first line treatment options in patients ineligible to cisplatin. Considering the second line setting(relapse after 1st line chemotherapy), Pembrolizumab has been shown to be superior to chemotherapy in an international, randomized, open label phase III study (KEYNOTE-045). The second phase III randomized trial (IMvigor211) was biomarker driven, and the primary endpoint was to assess a survival benefit in patients who overexpressed PD-L1. However the primary endpoint was not met but the exploratory analyses showed that in the overall population regardless of PD-L1 expression there was a survival benefit in favor of Atezolizumab compared to chemotherapy. Considering also the retrospective results from other immune checkpoint inhibitor drugs that have not been yet prospectively tested, five agents have been therefore approved for the treatment of metastatic urothelial cancer as second line therapy in the USA. In first line therapy of fit patients (eligible to cisplatin), the role of immunotherapy has yet to be determined, as there are at least three ongoing randomized control trials. All of these trials test different drugs but have similar designs. They are composed from three arms: monotherapy with checkpoint inhibitor alone, versus chemotherapy alone, versus the combination of both treatments. They include both cisplatin eligible and cisplatin ineligible. PD-L1 was thought to be a good marker to understand which patient might benefit more from immunotherapy. That is true for some cancers, but up to now we were not able to prove this association in bladder cancer. Specifically discordant results were reported considering first line or second line or even in phase II versus phase III trials. Moreover, differences exist regarding tools used to assess the presence of PD-L1 among different trials. Given these differences, we thought that expression of PD-L1 should not have been considered for the selection of patients. 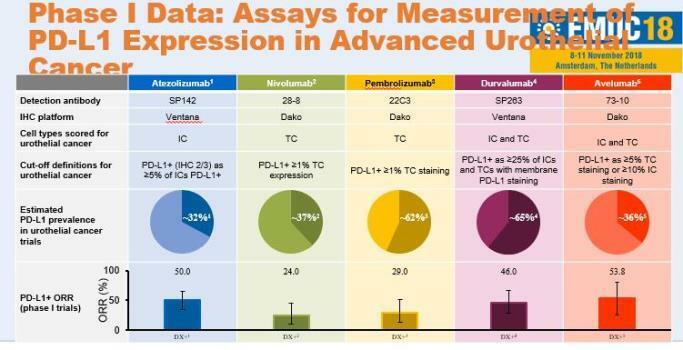 However, 2 months ago FDA and EMA suggested, based on data of the ongoing trials not yet published, that in first line, patients expressing poor levels of PD-L1 should not be treated single agent with immune check point inhibitors. 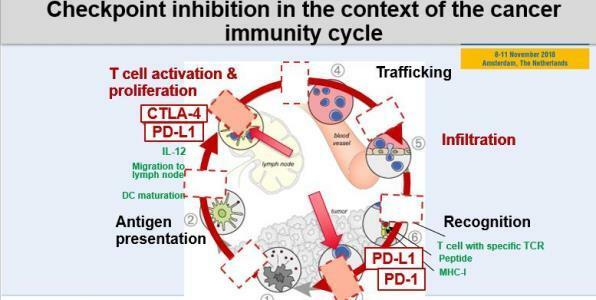 To understand this association with a marker and the response to immunotherapy, it has to be considered that the cancer immunity cycle has 7 steps; however we have drugs to block only 2 of them. If the interaction point is somewhere else, clearly our drug will not work. We have to collect other information to predict response of drugs and maybe cancer phenotype may help to select some of them said Dr Bamias. 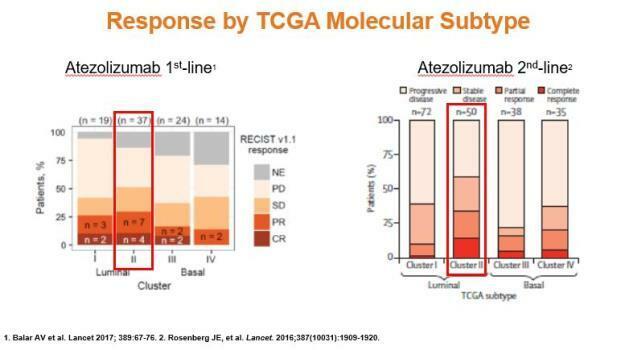 For example, some data suggests that looking the phenotype might be useful to predict response for both atezolizumab and nivolumab. Specifically, the negative selection could be important. For example, if a patient harbors a FGFR3 alteration, they belong to the luminal A phenotype which correspond to the immune desert and suffer from a low response rate to immunotherapy. However, a specific drug inhibiting the FGFR pathway (erdafitinib) will produce an excellent response. In conclusion, Immunotherapy is here to stay. First line, we can consider it. Cisplatin-ineligible and high PD-L1 expression. Poor response to neoadjuvant chemotherapy or adjuvant chemotherapy with cisplatin based regimens.